James at 16th and Georgetown has uncovered Will Power's new color scheme. It doesn't have as much to do with Verizon Wireless anymore. It does however harken back a bit to a previous Penske car that had some notable success in 1987s. I'm guessing most of you will greet Will's new livery with approval. One thing I'm still wondering about is the reasoning for Will's part-time schedule that The Captain has prepared for him in lieu of the Helio Castroneves acquittal (and subsequent outbreak of hugging and crying). Running a third car at Indy makes complete sense since the purse is so significant, but for all other races Team Penske has more to lose than gain (at least in a financial sense) by fielding Will. 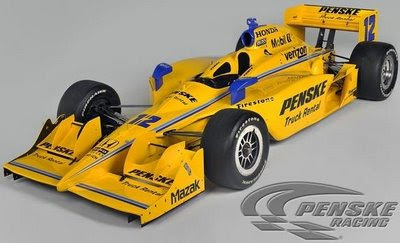 The only explanation is that Team Penske is preparing to be a three-car team in 2010. If that's the case, would that be a good thing because it's one more full-time car or a bad thing because it's one more full-time car for one of the two teams that win nearly every race? Lots of possible answers come to mind as I thought about the question of why, but also more questions. 1) RP is giving Will a few races because he knows Will is a winner and Penske wants to keep him for the future. Will can't be real content sitting out almost the entire season. 2) The role of spoiler of the championship sniff for TCGR...more potential to interfere with Dixon's and Dario's quests for their own repeats...but, what if Will is positioned to win races and take points from Helio or Ryan? Is he going to be urged to "save fuel" and relinquish a win for the sake of the full-time guys? 3) Just allowing/ensuring that Will gains that much more experience and thus becomes an even better test driver for further development. A pending new chassis (Robin Miller thinks it'll be here by 2020!) will need some work and that's an area where Penske Racing usually shines. 4)Planning for future scenarios, such as when Helio opens a chain of dance studios or investment brokers. I demand Will Power sport the Al Unser helmet haircut, complete with early 70s sideburns. The only explanation is that Team Penske is preparing to be a three-car team in 2010. Uh-Oh. The last time Roger Penske fielded a three car team, it was smack-downs a plenty for the rest of the field. I wonder if Roger is planning an "ultra secret" pushrod Honda V8 for the 2010 Indianapolis 500. I thought of the Pennzoil cars when I saw that. Don't like the BLUE mirrors... make 'em YELLOW or add more BLUE to this livery. JMO. I think it is that he wants to give Will a chance to be picked up by another team. If that doesn't happen RP will either use him on his sports car team or cut him loose. He already has two winning drivers and I don't think he wants more. But he is trying to give Will a good showing so he can get another ride. My 2 cents.